There is a lot of inner dialogue that goes on and there is a lot of outer dialoguing that goes on. The inner dialogue comes from the person within. It talks to oneself sometimes words of encouragement, and that’s okay. But, when it begins to express doubt, confusion and rehearses hurt repeatedly, it becomes a dangerous voice causing one to lose out on some of the best stuff God has for them. The outer dialogues we hear daily comes from the voices all around. Again, sometimes one may hear words of love, but when these voices speak criticism, discouragement, and put-downs, their words need to be silenced and replaced because they are not doing anything to one up or to help along the way. Any voice, inner or outer, which speaks contrary to the words of the Father, must be made to shut up. 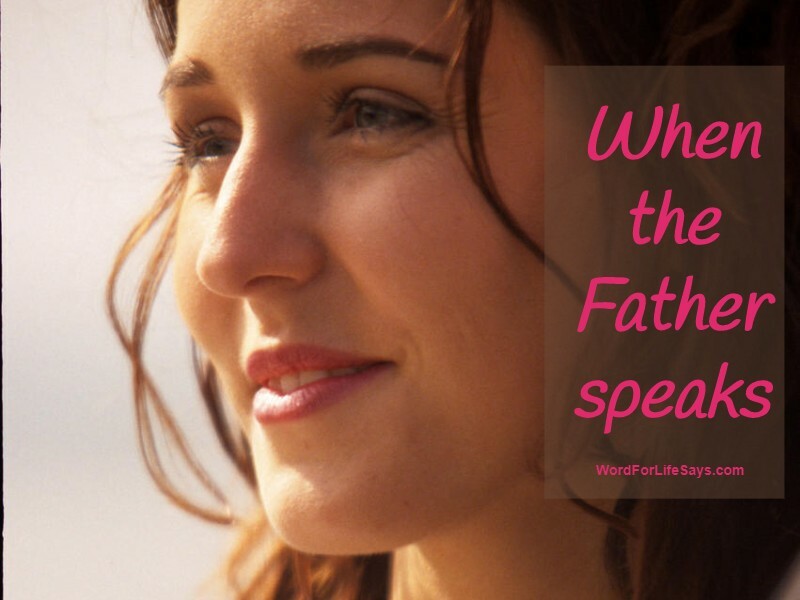 When the Father speaks, His is a heavenly dialogue, and what He has to say far outweighs any word on earth. When the Father speaks His words are power. “God hath spoken once; twice have I heard this; that power belongeth unto God,” (Psalm 62:11). Every other speech will fail and grow weak when it meets up against the strength of what He has to say. “For the word of God is quick, and powerful, and sharper than any twoedged sword…” (Hebrews 4:12). When the Father speaks His words are fulfilling. “So shall my word be that goeth forth out of my mouth: it shall not return unto me void, but it shall accomplish that which I please, and it shall prosper in the thing whereto I sent it,” (Isaiah 55:11). In the sea of worthless words that drown the hearing of this world, God’s Word can be trusted to do what He said He would do. It will succeed at everything spoken of it. When the Father speaks His words are truth. False speech seems to dominate this world. Whatever the platform, people are careless and deceitful with the words that they throw around. But God’s words are dependable and faithful. They are “truth” (John 17:17) and His words don’t lie (Numbers 23:19). “For the word of the LORD is right; and all his works are done in truth,” (Psalm 33:4). When the Father speaks His words are life. Jesus said, “…the words that I speak unto you, they are spirit and they are life,” (John 6:63). Not only are His words filled with life-giving power in the here and now, but when He speaks they are words of eternal life (John 6:68). For those who believe in His Word, it will provide them with everything they need to live. And, when the Father speaks, it is forever. “The grass withereth, the flower fadeth: but the word of our God shall stand for ever,” (Isaiah 40:8; see also Matthew 24:35). There will never be a time when His Word will not be. All the inner and outer dialogues that take place daily will eventually pass away. But, everything declared in His Word, shall be forever. It’s not going anywhere. Therefore, we can stake our very lives on it, live by it, and hope in it. Because, when the Father speaks, His Word will always be there for us through it all. Today, when the Father speaks, let His voice be louder than all others and let His words be the strength for your day. “The root of everything we are and everything we do grows from the heart. Proverbs agree, saying, “Keep thy heart with all diligence; for out of it are the issues of life,” (4:23). Every action and word proceed from a planted seed in the heart. Even right down to our giving. God wants people who, from their heart, are happy they can help and are willing to do so. God doesn’t want to twist an arm to get people to move. He wants people who don’t mind giving from a generous heart. “The church at Jerusalem found themselves in a time of need. Due to persecution, threats, and the like, many Christians fell on very hard times. If we turn back to Acts, we see some who took their giving campaign to the next level to help alleviate the need some faced. They went beyond just giving an offering, but they sold personal possessions to satisfy the great need of lack that was prevalent amongst its members at that time (Acts 4). They didn’t mind sharing from all that they had. Now, the Apostle Paul is addressing those in the Corinthian church with the subject of giving and sharing their own resources. He wasn’t picking on them or pointing them out. The members there previously agreed to provide some financial relief to those at the Jerusalem church who were in need, and now, with over a year going by (2 Corinthians 8:10-12; 9:2) without seeing the fruit of what was promised, the Apostle Paul is encouraging them to continue to work toward that goal of giving, unless when they show up with others from Macedonia, whom they previously boasted of their giving to, accompanying them, find them “unprepared,” (2 Corinthians 9:2-4). With that being said, I hope this helps. Many blessings to you! !